Making progress! As the year comes to an end, I’ve decided I should take a look at what I’ve accomplished this year. Most days are wrapped up in what has to be done and being overwhelmed by it all. So today, I’ll take a look back. And there is my first tip for this week. #1 – STOP! PAUSE! And take a look. Don’t get overwhelmed by the big picture, when the smallest accomplishments are right there in front of you and complete! I’m still making my mini flower garden project. Even though I have several more to complete, I have one star point done! –So, how about that year of mine? JANUARY – I taught a “Strings” class for my quilt guild. FEBRUARY – a great quilting guild Getaway and a trip to Louisiana to vend at the NLQG quilt show where my friend, Kathy Huff, was the featured quilter. MARCH- I vended at Thimble Pleasures quilt show where my “It’s Raining Circles” quilt WON third in medium bed quilts! Then off to Lancaster to vend at the AQS Week. I helped a local church make dresses for a mission trip. APRIL – AQS Week – PADUCAH!! My four classes all sold out!! and my mom and SIL helped man my booth. MAY – trunk show for Herring Run Quilt Guild and Spring Market in Pittsburgh. JUNE – made sit-upons with a Girl Scout troop and attended and demo’ed at a Sew-cation at Sturbridge Quilting and Sewing Center. JULY – off to Charlotte, NC to vend at The AQS Week. Thanks to all who participated in The Notion Commotion Blog Hop. AUGUST – a grand time at the AQS Week in Grand Rapids, MI included fun with my mom and SIL again. SEPTEMBER – renew family connections on my way to AQS Week in Chattanooga, TN. OCTOBER – found me in KCMO (my hometown!) to watch the boys in blue-KC ROYALS!! And then to vend in DesMoines, IA for AQS Week with my bestest friend and quilting buddy. Ending the quilting with a bang in Houston, TX for Fall Market and Festival running into NOVEMBER. I ended the year by taking a class with Linda Warren in DECEMBER and teaching a Machine Quilting class at Sturbridge Quilting and Sewing. WOW! It is good to take a look back and thanks for reading to the end! I loved meeting so many of you quilters around the country! #2 – drop your threaded needle and let your thread unwind to keep from getting twisted and knots. Have a safe New Year’s Eve celebration and see you next year! 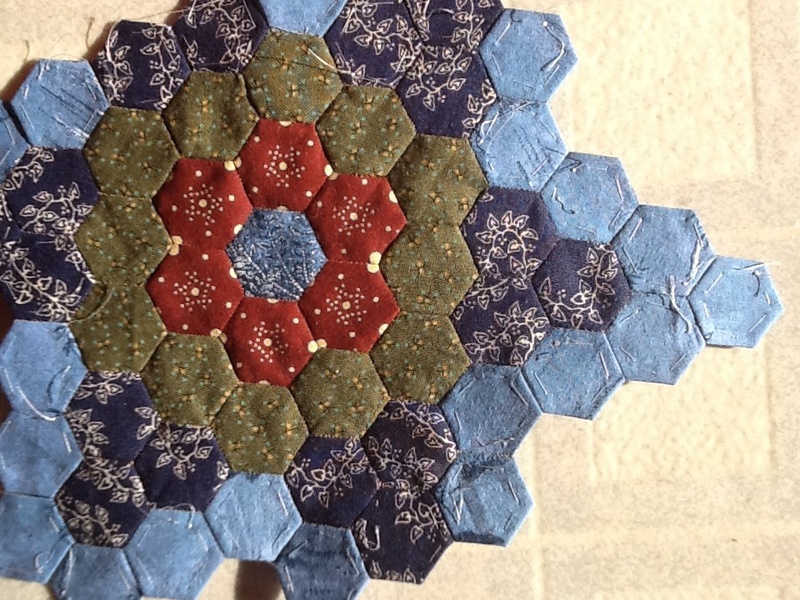 This entry was posted in Handwork, Quilt shows, Tips, Uncategorized. Bookmark the permalink.